Whether you're creating a project or using vellum for writing, you can find everything you need for your project at HSN. Create a scrapbook and adorn it with vellum stickers to add a stunning touch to your finished project. You can also use the vellum paper with other types of paper in your scrapbook to add dimension and texture to the finished product creating something beautiful. Try out Anna Griffin's scrapbook supplies, stickers, and parchment paper to add a touch of elegance. Vellum paper also works well for other projects, such as creating invitations. 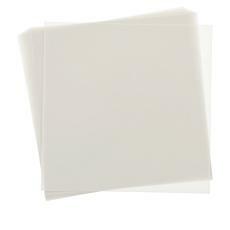 Add texture to your projects with parchment or vellum paper. It gives your projects a regal appearance and makes them look expensive and sophisticated. You can do endless things with vellum. Create a translucent design for a candle holder wrapped around glass. Design a beautiful photo or inspirational quote to frame for your home or to give as a gift. It works for anything you want to enhance with a little texture. Shop HSN for all your crafting needs. Whether you're looking for vellum to create a scrapbook or you need clear covers for the finished project, you can find everything here.